Apple TV owners waiting for an Apple-branded over-the-top television service will likely be twiddling their thumbs well into 2016, as the company has reportedly tapped the brakes on its Internet streaming initiative, according to CBS chief Les Moonves. Moonves dropped the Apple TV tidbit at Business Insider's Ignition conference in New York on Tuesday, saying he thinks Apple is putting the program on the back burner, reports Bloomberg. "They've had conversations on it and I think they pressed the hold button," Moonves said. "They were looking for a service." 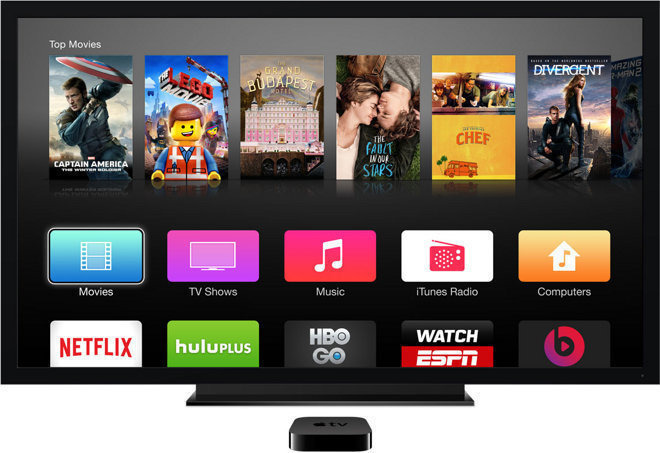 Rumors of an Apple TV subscription service date back to 2013, when reports claimed the company was going over cable companies' heads to negotiate directly with content providers. At the time, and for many months following, it was speculated that a subscription-based product would launch alongside new Apple TV hardware. Unlike monthly offerings from cable companies, Apple is said to be working on what is referred to as a "skinny" bundle featuring live and on-demand TV from major networks and select cable channels. Subscription price estimates are up in the air, but some suggest Apple could charge anywhere from $10 to $40 a month. Apple debuted a revamped fourth-generation Apple TV in October, complete with a new tvOS operating system and dedicated App Store, but an over-the-top streaming service was nowhere to be seen. Moonves, however, believes skinny bundles are the future. "This will happen," Moonves said. "It has four major networks and 10 cable networks, let's say, and the price point will be in the $30s, $30 to $35, $40 maybe. People will not be spending money on channels they don't want to watch." The concept is popular with cord-cutters and thrifty consumers, but cable companies are keen on keeping their revenue structures in place. With Apple putting a hold on negotiations, it seems the enterprise is being pushed further into the future, perhaps beyond the rumored 2016 release reported in August. Update: Bloomberg, citing informed sources, has confirmed Apple's decision to suspend its streaming television service initiative. In lieu of a branded channel package, the company is said to be focusing on building out the tvOS App Store as a platform on which media companies can sell directly to customers.